Work, but don’t forget to live | Run, Lindsay, Run! I came home last night after a 12 hour workday, pretty exhausted. I stared at the pile of laundry I had yet to put away from Sunday, and the suitcases I had yet to fully unpack from my trip to CA and Boston a good 2-3 weeks ago (I am the worst unpacker). Stressed and unable to even deal with the messy state of my room, I made myself a cup of relaxing tea and got into bed. I love Yogi brand tea not only for the delicious flavors (yay Ginger tea!) but also for the cute phrases on the tea bags. Last night’s was especially true. Work, but don’t forget to live. As a 24 year-old living in NYC, the city that never sleeps, and working at a PR agency (#2 most stressful job according to CNBC? ), it’s a constant struggle to find a work/life balance. Some nights I am breezing out the door at 6, other nights it’s well past my usual bedtime after I head out. It ebbs and flows, and is in the nature of the fast-paced job, which I love. I want to excel at my career, but I also want to have a life! and run! and sleep! and hang out with friends! and watch mindless TV! and clean my room…sometimes. You can’t give 110% to everything, all the time. This tea bag reminded me that yes, it is important to work (and do well at it of course), but what’s the point of it all if you’re not enjoying LIFE, too? Sometimes you have give more to work, just as sometimes you give more to the other areas of your life. I managed to get out at 6:40 this evening (a good night!) and cook a nice dinner and write this post, and it felt good. I just needed a reminder. I am not going to have any guilt about leaving at 6 p.m. tomorrow to get home, change, and make it to my 2nd CPTC workout- mark my words! On a completely different tangent, I have been trying to add more vegetables into my eating routine as of late. Not really to replace anything, but rather to supplement. I already eat pretty balanced, but there is room for improvement (says the 10 handfuls of jelly beans and chips I devoured today…) Over time, I have found that my body is actually craving veggie-based dishes. Funny how that works. Instead of the meat as the main course, and veggies on the side, I have been trying to amp the veggie presence to make it the main star or try alternatives like tofu. No worries, I am not going vegetarian (I love chicken and burgers too much, and I need the iron), but I do think there is some benefit to adding in more of the good stuff like vegetables and beans and tofu while ensuring you’re still meeting your nutritional needs in other areas (protein, fat, calories, etc.). Here are some of the delicious dishes I’ve had this week….sans meat! PS- the Sabra “to-go” containers of hummus are actually 2 serving sizes– seriously? Who eats that little hummus?! This salad was refreshing and flavorful, while still pretty filling for not having a topping like chicken. 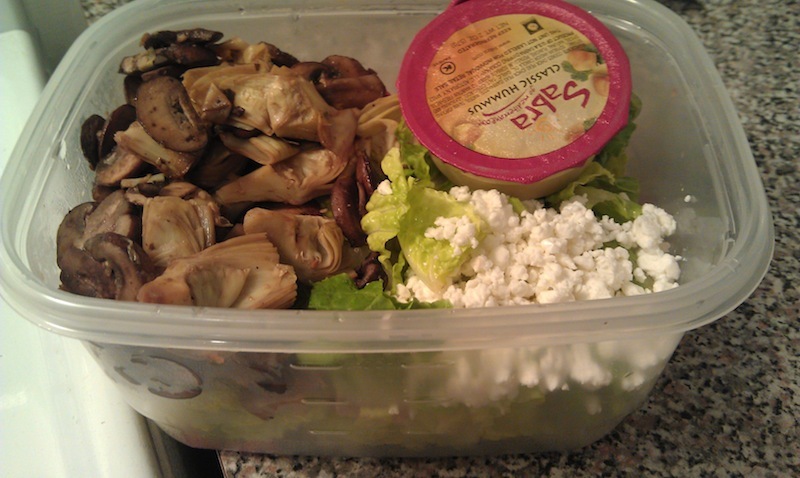 Loved the combination of hummus and feta! 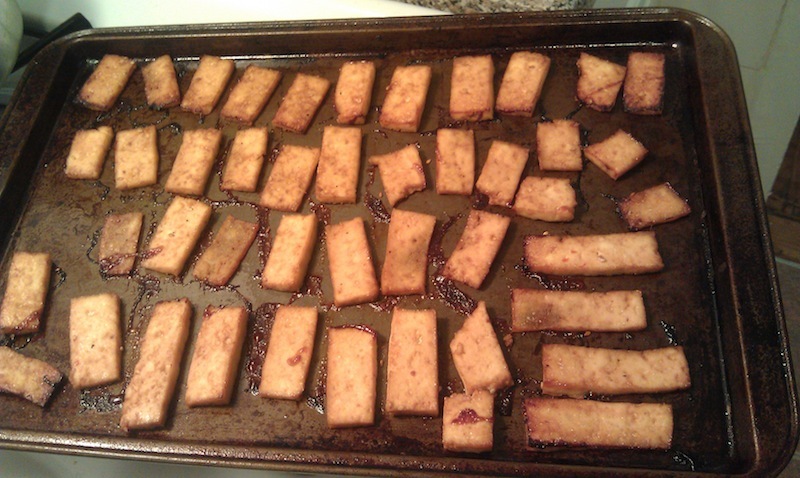 Bake tofu in oven on 350-375, for about 10-15 minutes on each side. And add to stir-fried veggies and/or over rice! 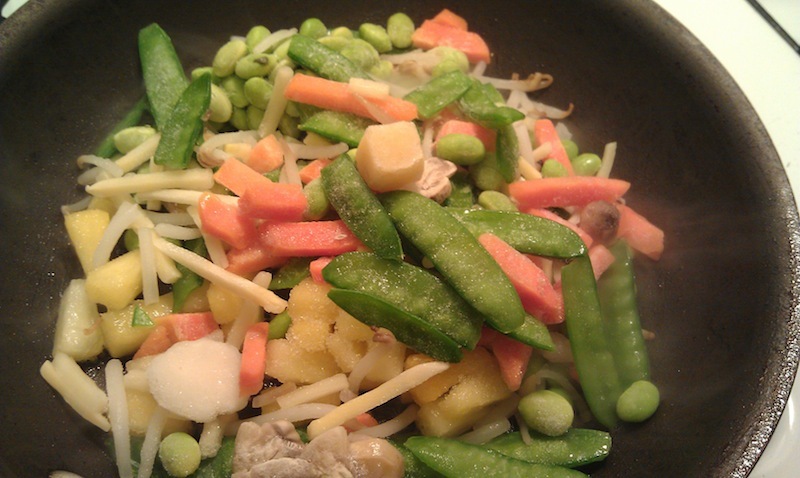 My mix contained frozen pineapple, edamame, and frozen stir-fry veggies from TJ’s. And that’s all I’ve got for you so far. Running-wise, I’ve been feeling some tightness in my hip/IT/piriformis so I have been foam rolling like crazy and sitting/rolling on a tennis ball while at work to relieve the tightness. It comes on about 3-4 miles into each run, and isn’t excruciating but is enough to kinda throw off my stride and be annoying. Took a nice rest day today so fingers crossed I will be feeling fresh tomorrow and this stays at bay. How do you find a balance amongst all your priorities (work, school, running, friends, LIFE)? How do you make meals with veggies as the star a bit more interesting? 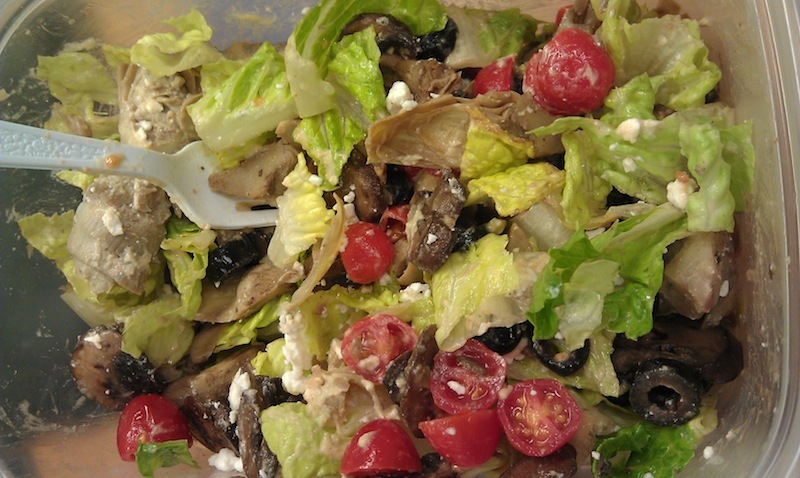 Salads bore me easily if they’re plain and not-filling, so I welcome any suggestions! I definitely think it’s important not to get caught up in working ALL the time. I don’t understand how some people work so much!! Maybe it’s because I’m not totally fond of my job, but I’d definitely rather be doing other things. Making plans with people on my days off (even in the middle of weird stretches of night shift) makes me feel better and like I’m living instead of just going through the motions. I’ve found that a good mix of veggies in a delicious salad (on a spinach salad kick right now) is the best way to get in my vegetables. If I work up the courage (and wake up at a decent time…), I may end up at CPTC tonight…I’m nervous!! 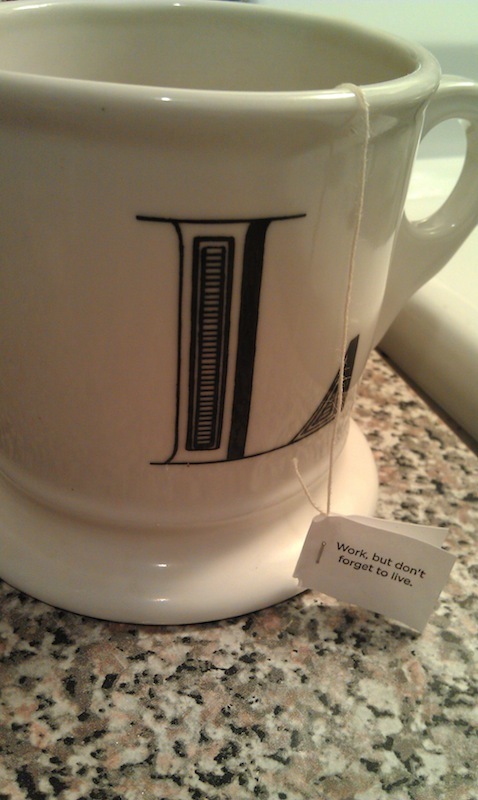 Love that quotation – I might need to pick up some Yogi tea. 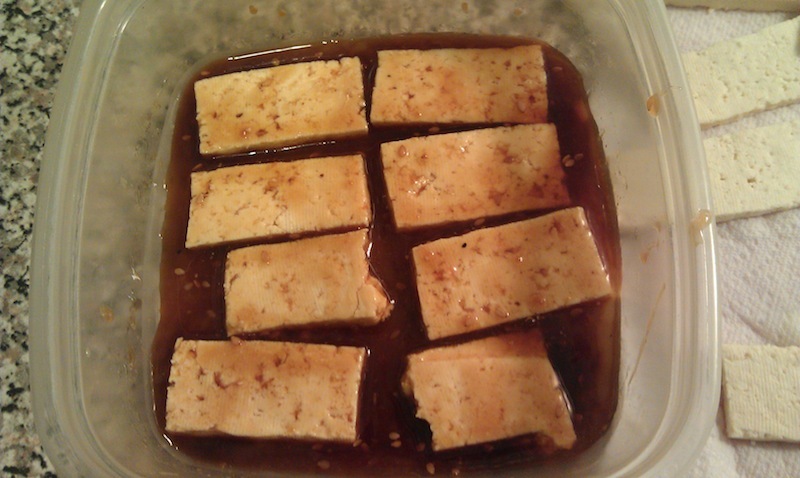 Your tofu looks fab! Did you press it first? Just found your blog. Love this post – it had a nice message. I am also from NYC and busy busy busy. Still trying to find my balance, that it why I started blogging. Sounds weird to toss another responsibility on to find balance, but I think it is working! I love making veggie centric meals. I like to eat a lot and veggies make it possible. 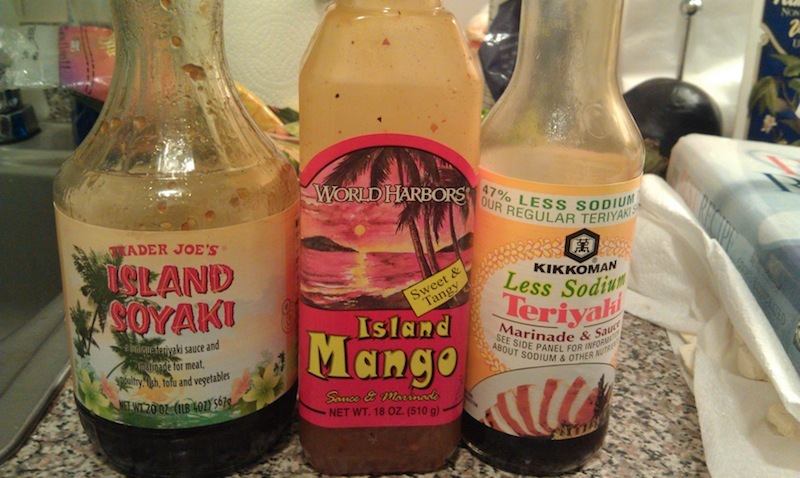 I use spices and hot sauces to kick up my veggies, and also not add calories. I love what you did with the tofu. That is very similar to something I would make! Ugh, I totally believe that CNBC stat and can relate far too much to the crazy, unpredictable PR hours. they can take their toll. Finding a balance is something I always stuggle with, but making lists and schedules with priorities tends to help. I love mixing veggie dishes with some cheese, quinoa and/or beans to make them a bit more filling and get in more nutrients! I think the work/life balance is so important for mental sanity and a good personal/family life, yet so many people neglect it. I’ve gotten in the habit of not even opening work emails on vacation or when I get home for the day. I also stopped stressing over work things when I got home and just made myself relax by unwinding on the couch, blogging or making dinner instead. I go by the “whatever it is, it can wait until tomorrow” motto. I suppose some professions are more difficult to do this with, but I could never be totally absorbed in work. Also, congrats for signing up for NYC again!! Are you thinking sub-3? 🙂 You are an incredible runner and I’m definitely going to check out your training plans! unrelated to the post (which is great, too), but wondering if you had any tips or things you wish you would’ve done or did not do in training for NYC? I’m running it this fall. Thanks!